How can we secure a sufficient and sustainable food supply for a growing world population? The Western world consumes massive amounts of food, from which a significant part is wasted every day. Our current livestock farming uses a lot of water, land, and energy, and emits a large quantity of greenhouse gases every year, contributing to climate change. At the same time, low-income countries are struggling to provide their population with enough protein-rich food. Besides that, growing amounts of waste are an increasing problem worldwide. This waste includes organic waste streams from agriculture and households. Fortunately, since a few years some important changes can be seen. There is a growing demand for meat substitutes and more sustainable products. People are becoming more aware of environmental issues. However, most consumers are still unaware of the environmental impact of meat consumption or unwilling to change their diet. Moreover, most consumers are unwilling to spend more money on food that is environmental friendly. Imagine you’re in a cafeteria and you can choose between two snacks; one is just the regular product you already know and the other one is a product that tastes and looks the same, but is cheaper, healthier and environmentally friendly. Which one would you choose? 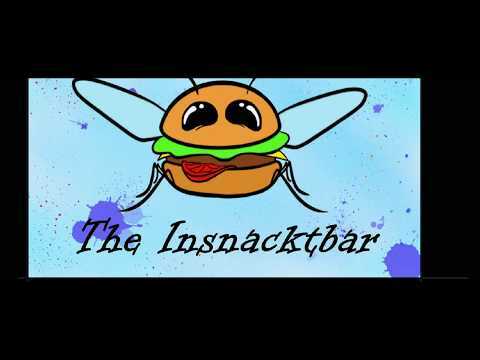 Our idea is ‘the Insnacktbar’: a cafeteria that sells fried snacks with insect meat as the main ingredient. Think of hamburgers, chicken nuggets, croquettes, meat rolls (“frikandellen”) and more. The products that are sold are not completely new or different, but a better version of products that are already in our everyday diet. The insects are completely processed in the product, so the insects are not visible. This makes the product more appealing for consumers, because people can be hesitant towards eating something completely new. What makes our products different from their regular version and plant-based versions is the high nutritional value. Insect meat is rich in proteins, low in fat and contains vitamin B12. However, the promotion of our products is not focused on eating alternative and healthy food or being ‘hipster’. In this way we can reach our target group: people with an average income that want to contribute to a better environment to some extent, but without radically changing their own diet or spending more money. Slightly changing the consumption pattern of this target group will have a high impact, because this is one of the hardest groups to reach within the protein transition. The production of insects has many advantages compared to the production of regular livestock: less land, water, energy and feed is used, and limited amounts of greenhouse gases are emitted. In addition to that, insects can be grown on organic waste streams, which contributes to a circular economy and less food waste. The production of insects is very quick due to their fast growth and high reproduction rates, which makes insect meat cheaper than conventional meat when both are grown on a large scale. In short, our product and its production process is better for human health, the environment and has economic advantages. Besides the products itself, the whole concept of ‘the Insnacktbar’ will contribute to the transition towards more sustainable food consumption in an approachable way.